Home to Phuket, Surat Thani, and Bangkok (its capital), Thailand is often considered one of the cheapest countries to travel in, with costs in the order of $35 per day. Numerous airports service the country, most notably Suvarnabhumi Airport outside Bangkok. The country is tropical, meaning that while temperatures fluctuate between 24 and 35˚C (75°F – 95°F) throughout the year. Most tourists come during the dry season, especially in December. Classic Thai souvenirs include handwoven garments and religious trinkets. 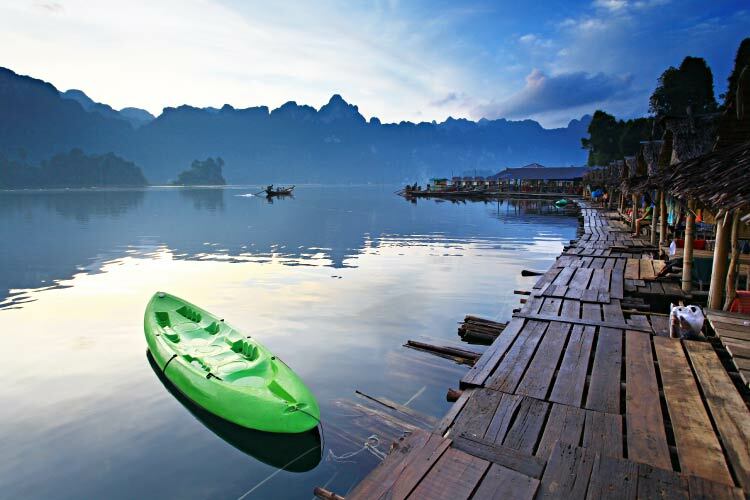 Often cited as the backpacking capital of world, Thailand attracts travelers seeking gorgeous beaches, friendly locals, succulent food, and perhaps most importantly, rock bottom prices. Travelers looking to stretch their dollar as far as possible would be hard pressed to find a more economical country. 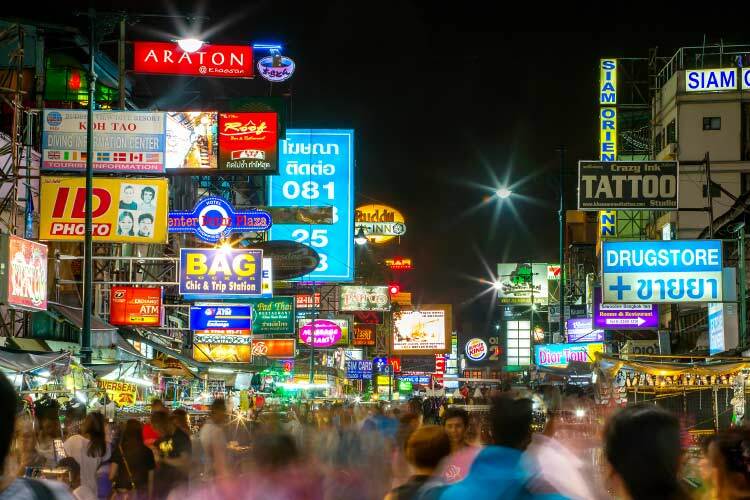 However, don’t let the low prices fool you: Thailand enjoys a well-developed tourism industry and holds hundreds of modern hotels, restaurants, and other travel amenities. For this reason, millions of travelers stop in Thailand each year, and many of the cities (particularly Bangkok) contain districts catering specifically to tourists. Like the rest of Southeast Asia, Thai culture is highly influenced by the presence of Buddhist, Hindu, and Islamic traditions. Most Thai people practice at least one of these religions, and many practice a combination of the three. Travelers ought to be aware that Thailand takes religion seriously, making research on Thai religious customs a necessity. For instance, it’s considered a great offensive to point the bottom of one’s feet at someone. Though most travelers spend time in Thailand’s sprawling metropolises, its beaches and islands also merit a visit. Lots of Thai coastal cities offer incredible beaches and come complete with historical sites, cheap bars, and eateries. Inland from its azure waters and pristine sandy coastlines sits dense forest with a huge variety of wildlife. 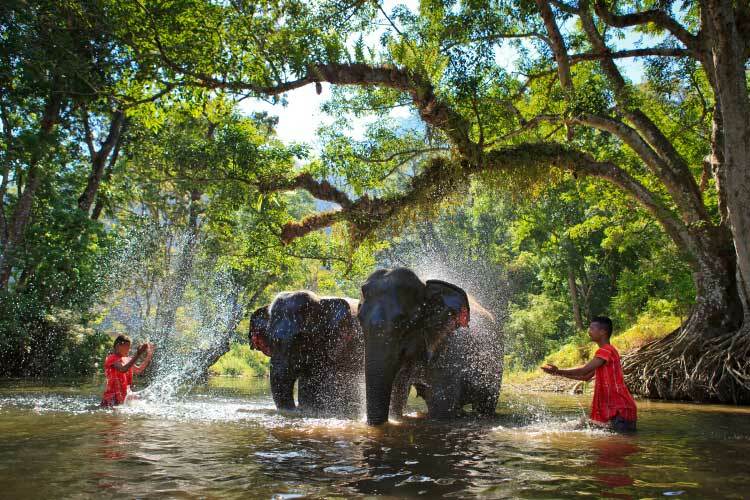 A visit to one of Thailand’s numerous national parks is a great introduction to the country’s rich host of flora and fauna. Thai food enjoys worldwide popularity and Thailand is known as one of the best places to eat and drink; their food often features rice, pasta, chicken, fish, and peanuts. The country’s national dish is Pad Thai, though curry and fried insects are also consumed in great quantities. In urban Thailand, it’s actually more cost effective to eat out instead of visiting a grocery store, and most locals purchase all their meals from the omnipresent street carts found quite frequently in all Thai cities. Few would contest Bangkok as Thailand’s top travel destination. This lively city swarms with life in a way matched by no other city in the world. 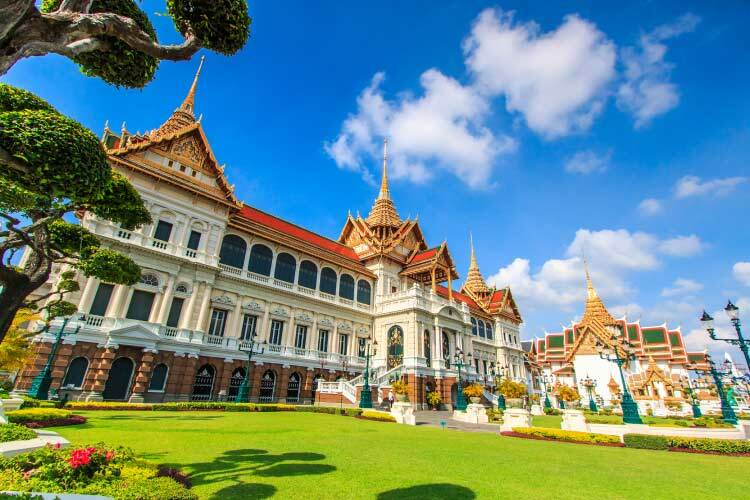 Numerous historic sites dot the city, including the Grand Palace, the Jim Thompson House, and temples like Wat Arun and Wat Pho; however, the best way to experience what Bangkok has to offer is simply to amble through its streets, wandering in and out the numerous shops, bars, and artistic venues. If you only have a limited time to experience Bangkok, be sure to stop by Khao San Road. Known as the best backpackers street in the world, Khao San Road holds tons of unique shops, bars, and even venues hosting the infamous ladyboy shows. Be aware that scams are very common near Khao San Road. As Thailand’s premier coastal resort city, Phuket features upscale resorts, beach bars, and miles of stunning coastline. 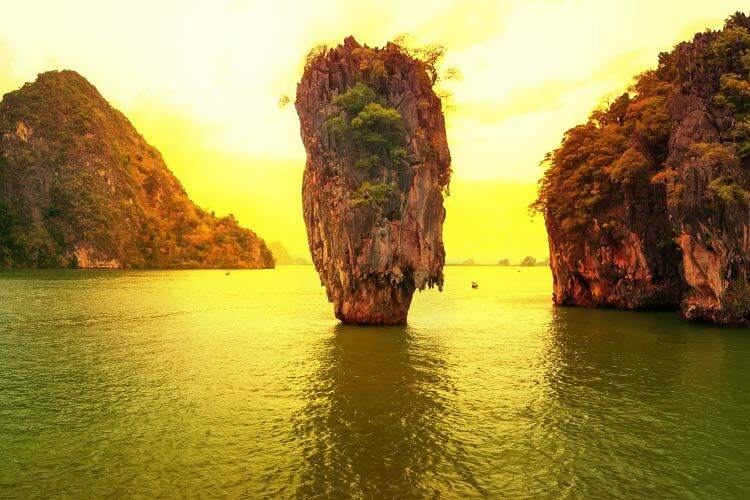 Most travelers in Phuket rightfully wish to soak up some rays while relaxing at one of the city’s plentiful beaches; Phang Nga Bay is the most famous coastal area and is distinct thanks to its steep limestone cliffs and small barrier islands. Inland Phuket contains a charming old town and bumping nightlife scene, especially near Bangla Road. Known as Thailand’s commercial capital, Surat Thani plays a critical role in the country’s economic wellbeing. While tourists sometimes visit the city for its local culture, most travelers only stop in Surat Thani as an intermediate point before traveling to the Gulf Coast Islands of Kho Phagnan, Kho Samui, and Ang Thong National Park. All three of these islands are known for their beautiful landscapes and waterfalls. Furthermore, Kho Phagnan features a very active nightlife scene, which peaks during the massive full moon parties. 1. After checking out Lampang’s famous temple Wat Phra That Lampang Lung and marvelling at its architecture, travelers often visit the national parks surrounding the city, particularly Chae Son National Park. Then, ride some elephants over at the Thai National Elephant Institute. 2. Explore Khon Kaen’s famous dam, Phong Nip. Next, head over to Khon Kaen’s street markets to watch artisans weave fantastic silk clothing and other woven items, many of which bear the city’s signature weave pattern. A number of national parks and animal preserves surround the city and definitely merit a visit. 3. Fill up on food at one of Bangkok’s numerous street carts, then head on over to the famous Golden Palace. Adjacent to the south of this opulent palace sits one of Thailand’s most famous temples, Wat Pho, and further south sits the immense Golden Buddah. Later, head to Khao San Road (pictured below) to sample Bangkok’s wild nightlife scene. 4. Chumphon’s most famous attraction is the Prince Chumphon Shrine, which is built from a repurposed war ship. After strolling through Chumphon’s historic centre, take a visit to Cowboy Country, an American Western themed “town” near Chumphon complete with saloons, teepees, leather tanners, and all the other staples of an 19th century Texas frontier town. 5. Spend time in Surat Thani’s plethora of boutique shops, then head out to one of its numerous coastal restaurants for great food with a view to match. For an interesting afternoon, visit the Monkey Training Centre, where monkeys are taught to collect coconuts. Guests can actually stay in bungalows at the Monkey Training Centre before heading out to the Gulf Coast islands. 6. After exploring Phuket’s old town, investigate its undersea territory via scuba diving or snorkeling. Be sure to check out the islands in Phuket’s bay, which hold an immense amount of aquatic wildlife. For the adrenaline junkies, Phuket is famous for cliff diving, but the rest of us will enjoy being pampered at one of the city’s many, many spas. 7. Famous for being the setting of dozens of movies, the beaches of the Phi Phi Islands are the stereotypical bright blue water and white sandy coasts seen in movies like The Beach. Of course, the Phi Phi Islands one inhabited island (out of six) contains a variety of craft shops and exquisite eateries. 8. Ride elephants over at Nosey Park’s Elephant Camp in Krabi. Then, head down the city’s most famous beach, Railay Beach. 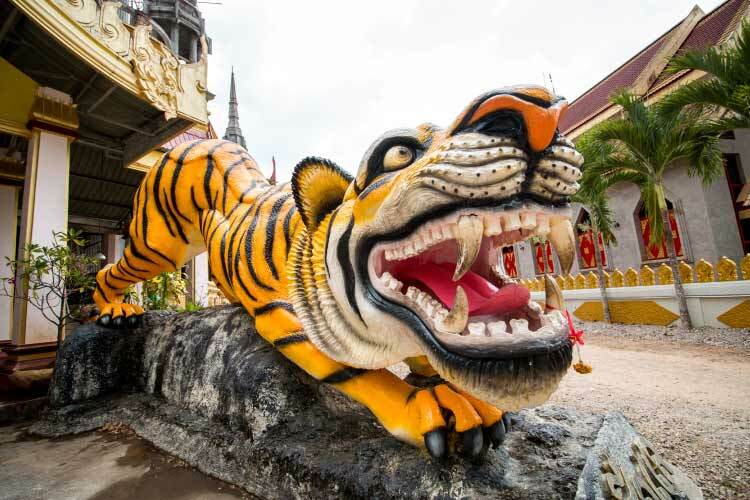 Krabi also contains Tiger Cave Temple, a cavern with fossils of what appear to be tiger tracks. Tiger Cave Temple holds immense religious significance to Buddhists, who have constructed a massive Buddha statue near the cave’s mouth.